get up in the morning? A commitment to take control of my health! Non toxic health, that is! I have a few mantras that I always recite. See if they make sense to you.. These are more reasons to be informed because I am the one who know best how I feel! What in your possession would you trade for your health? The desire to control what happens in your life, right? If this is your primary motivation-and it should be.. I mean NOTHING is more important than your health! Good health is a choice. The choices you make determine your health. Download FREE Book-learn health secrets of people who are perpetually healthy. This is why I publish Natural Health News, a weekly newsletter of my latest research on non toxic health. 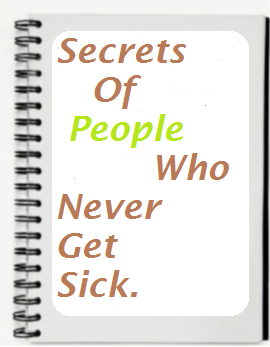 Subscribe to it and download YOUR FREE copy of "Secrets of People Who Never Get Sick"
Drugs that have higher chances of killing you than the diseases they are supposed to cure, are not medicines-they are toxins! What would you find in this Natural Health Newsletter? How about the fact that cholesterol is GOOOOOD for you..? Here is a biggie: Harvard University scientists were bribed by the sugar industry in the 60s to skew research results in favor of the sugar industry! And that Statins [Cholesterol lowering drugs] can give you a heart attack..
How about a natural molecule that beat Viagra in head to head tests to treat ED! And it can also help you live longer in good health for good measure! Or the fact that some one actually discovered the major causes of cancer and how to beat cancer naturally! Would you believe IN 1931!!! Won a Nobel Prize for it too! How come those Cancer Telethons never told you about that? If you were a subscriber to Natural Health News, you would have known that. How many more of these hoaxes are out there? Most of what you've been told about health..
Do you know what makes people sick the most? Do you know what kills most people? Regular medicine as practiced today! Subscribe to Natural Health News newsletter and..
..you'll be surprised at what they've been hiding from you!